Early Spring is a great time to get out on the water, get some fresh seafood for dinner, view the whales as they return to the north and maybe even hit the local hot springs for a soak. Winter 'Feeder' Chinook (Kings) mix with mature early run salmon presenting good options for the Tofino Angler. 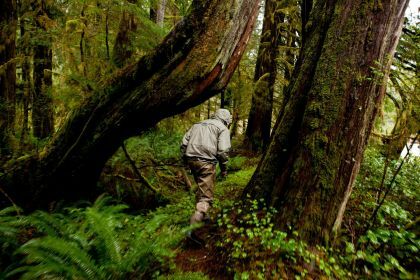 Typically full day trips include salmon fishing, prawning up the inlet, crabs in the harbour and potentially a trip to the Tofino hot springs. If the conditions permit there is opportunity for Halibut and Rock fish offshore. One of my families favorite winter dishes, besides fresh crab, is whole fried rock fish in a light batter, good stuff. Half day trips consist of either an offshore shot for salmon and bottom fish or an inshore tour that included pulling the prawn and crab traps and doing some salmon fishing. 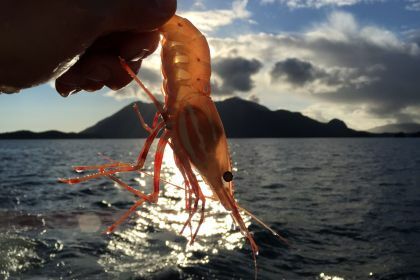 Its always interesting to see what comes up in the prawn traps, Spots prawns are the target but Side Stripes shrimp are tasty too. Squat lobsters, starfish and small crabs all turn up with regularity making it an interesting learning experience for young and old. Inshore trips are the way to go if you have kids in the group, calm waters and lots to look at. We have wearable junior sized life jackets on board for the kids. All of our charters are private allowing your guide to customize your trip to your desires. Early season rates available. For the more adventurous check out our fresh water Steelhead options. We offer a float plane access river drift trip that is an experience of a life time. Spend the day in remote wilderness and the evening in the comfort of your favorite Tofino restaurant recounting the days events. We have custom helicopter and drive in options available. For further information follow this link to our freshwater page. Please give us a call if you have further questions or would like to book.